GRAPES meeting attendees at the Chancellor Hotel. 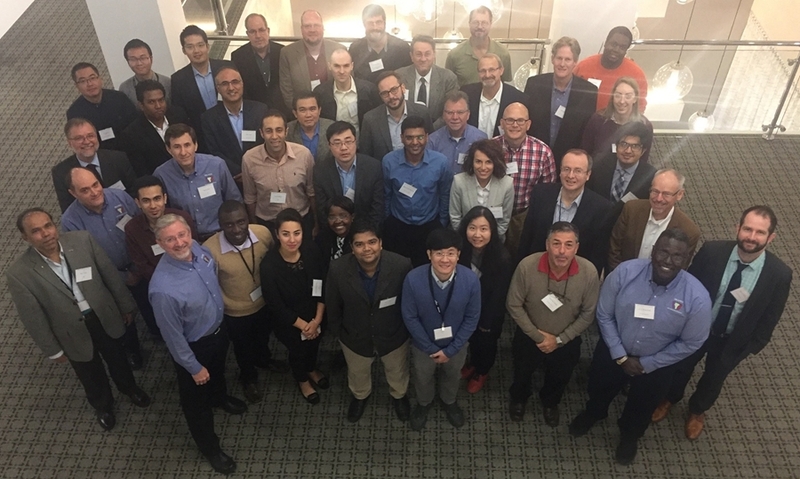 The NSF Center for GRid-connected Advanced Power Electronic Systems (GRAPES) in the Department of Electrical Engineering hosted its Fall 2016 Industrial Advisory Board Meeting on Nov. 10-11 in Fayetteville. The GRAPES meeting drew together faculty and students from four universities, including one international university, and industry leaders from 11 of the 15 membership companies. This meeting marks the sixth anniversary of the first GRAPES IAB meeting hosted at the University of Arkansas in November 2010. GRAPES is currently in its seventh year as an NSF Phase II Center. GRAPES is expanding globally, and recently signed a collaboration agreement with RWTH Aachen University (Germany) and currently working to add additional collaboration partnerships with research institutes in Mexico and South Korea. GRAPES facilitates close research interactions between university faculty and students and the industrial members of the center. This relationship gives researchers a direct tie to today's power industry, allowing them to research topics that are closely aligned with industry interests. It also gives the involved companies a clear voice into what the students are learning, and so directly improves the quality of the employees they will hire in the next few years. Nearly 100 undergraduate and graduate students have worked within the center. Many of these students have gone on to work for member companies, while others have continued their educations or gone to work for other companies in the power and power electronics industries. GRAPES leadership includes: Executive Director Alan Mantooth; Managing Director T. A. Walton; UA Site Director Juan Balda; USC Site Director Roger Dougal; UWM Collaboration Lead Adel Nasiri; RWTH Aachen Site Director Rik DeDoncker. GRAPES is a National Science Foundation Industry/University Cooperative Research Center. At this center, engineering faculty from the University of Arkansas and the University of South Carolina collaborate with members of industry to develop new technologies for advanced power electronic systems, develop new software and tools for controlling embedded- and grid-connected power electronics, and to educate engineers who understand the power electronic technologies that are important to our members. GRAPES' 16 member organizations come from commercial and government sectors of the economy. For more information on GRAPES, contact T.A. Walton, GRAPES managing director, tawalton@uark.edu, 479-575-4487. For more information GRAPES' next meeting, contact Karin Alvarado, karina@uark.edu, 479-575-4958.